Collectorz.com’s Game Collector solves one of the (few) downsides to digitally downloadable games; that you end up with a library of games that you don’t have sitting on a shelf. This can at times make it hard to keep track of everything that you own, especially if you’ve got multiple consoles and stuff stored on a range of devices. The software is an database application that can run across multiple devices. 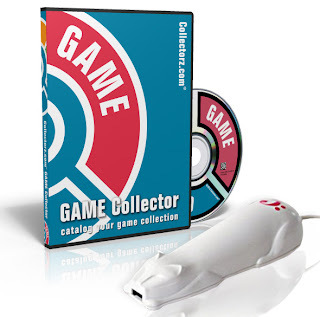 You’ll input the data via your PC (no Mac version at this stage, though there is Game Collector Connect, an online cloud-based database that Mac users can access), and then sync with the iPad, iPhone or other such device via an application for access on the go. It’s worth noting that the smartphone or tablet applications act as display-only devices, and are useless without the PC software. We’re told that there will be added functionality to the app versions at a future date. Data input is incredibly easy, and there’s multiple ways to do it. The most expensive, but most convenient way is via a barcode scanner (for the retail games, anyway. We’ll get to downloadable games in a moment) – a bit of add-on hardware that you buy from the Collectorz.com Website. There’s also an iPhone barcode scanner called “CLZ Barry” that will do much the same job as the hardware, but for the price of an app. When you scan a barcode, the software talks with Collectorz.com’s immense game database and then fills in all the game details for you – from developer and publisher, through to the game’s online options, the box art and a full description of the game and its features. You’re able to change any field that you don’t agree with, naturally, and indeed the Collectorz.com’s database entries are not always entirely accurate (for instance, putting some games in the wrong genre, or the occasional spelling/ grammar error in the product description). You’re also able to assign the game a rating out of 10, check a box if you’re completed the game, make your own notes, and list whether you’ve got the game “for sale” or not. If you don’t have a barcode scanner, you can do a manual search for the game. Once again, it’s amazing how comprehensive the database is. In my collection of 160 games, there were just a few instances where the database didn’t return any results when I searched for a game. The PlayStation 3 Cricket 2011 wasn’t in the database (though almost any other cricket game I could think of was), and none of my Japanese import games were in the database. Obscure launch Nintendo DS games (Zookeeper, Polarium), special edition PS3 games (Final Fantasy XIII-2 crystal edition) and old Xbox games that most people have forgotten about (Kingdom Under Fire: Heroes), were all there and fully-fleshed out with information. Hardware information can also be input, and the software already recognises the PlayStation Vita. The third option is to manually input all the details. This naturally takes a lot longer, and is unfortunately necessary for foreign language import games and most downloadable games. Virtual Console games on the Nintendo 3DS, for instance, were not there as “Nintendo 3DS games.” Many DSiWare games didn’t exist at all. But thankfully, it’s easy to run through the menus and boxshots/ screenshots are easy to source thanks to a handy online search/ import tool. Frankly, if you’re OCD enough to be interested in a database tool, this bit of work isn’t going to be a problem in the long run. Overall, depending on how big your game collection is, a solid week’s work is going to get a large collection across multiple consoles databases. So what happens next? Now it’s time to play with the masses of data that you’ve accured. Games can be filtered in whatever way you like, so if you want to get an easy overview of the order in which you really do like your Final Fantasy games, you can filter out that information. Data can also be displayed visually, as pie or bar graphs, broken into whatever metrics you like. Want to know what proportion of your game collection are JRPGs? Easy done. Want to know which console you have the most games for? The information is just a click or two away. It’s easy to take screenshots of that information and then share it around or just give yourself a deeper understanding of your gaming habits. Finally, it’s possible to export all of that data into a number of forms. You can export your collection as a .pdf, which just lists the games you own, developers and publishers. That’s an easy way to give friends an overview of your collection. Alternatively you can export the data as an .html file, which essentially builds a website version of your collection, displaying games, game information, ratings… the works. 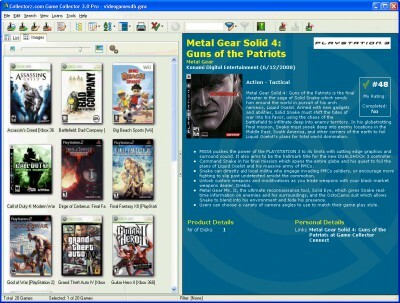 It’s also possible to link your PC software to Game Collector Connect for even easier sharing. It’s also possible to sync the data with your iPad, or other associated media device. This is more visual than functional, but it’s fun to have easy access to your entire collection at your fingertips, and again, there is work being done to make the apps more functional in the future. The presentation on these devices is quite nice, with the option to have an iTunes-style “jukebox” display style. It’s a bit of a pity you can’t input or edit data on those devices, but perhaps a future update can fix that. The presentation of the main software itself isn’t great, but at the same time it’s better than almost any commercial database you’ll ever use. The main thing is that it’s extremely functional an intuitive, and data entry is logical and easy for anyone to use. We’re also told that there will be a major update later this year that will make the experience prettier. I guess the main question that many would ask is “what’s the point of putting up the money for this tool – and it’s not cheap if you include the barcode scanner or iPhone/ iPad apps – when you can get a database for free through Backloggery.” Well, as the saying goes “you get what you pay for.” Backloggery is simple and social. It works, and it’s free. Now, that’s great for many, but some people might want more – more robust statistics tools, more customisable data entry, easier input options. That’s where this software comes in. I’d like to compare it something like Facebook, and one of those LinkedIn accounts where you hand over the money for the “professional” package. Sure Facebook is free and easy to use and lets you keep up to date with what your friends are doing, but for people with needs that run beyond Facebook, there’s LinkedIn. Likewise while Backloggery might be enough for many, people with 150+ games, or simply a desire for more control over their databases might want to look at this one as well. Item Reviewed: Review: Collectorz.com Game Collector database tool 9 out of 10 based on 10 ratings. 9 user reviews.